Christians in the US are not under hard totalitarianism, but we are in the midst of a struggle for the soul of our country. A couple of months ago I noted that the Church generally supports and cooperates with political authorities. She interprets their efforts charitably, supports whatever can be justified, and, when some particular measure is undeniably bad, tries to show what would be better. All that’s obvious good sense when Christian or natural law principles are generally accepted, or when government is mostly a matter of guarding basic social functions. In such settings, it makes sense to accept that government, however infected by human weakness, is basically natural and good. Hence the alliance of throne and altar in old Europe, and hence the Al Smith Dinner in 20th-century New York. To what extent does that approach make sense today? Modern thought tends toward the radical and transformative. It wants to reject the authority of nature, custom, and Christianity, and treat man as left to his own devices. It tells us, for example, that the human body has no natural meaning, so we are free to do with it what we will. If we want to redefine human life or marriage so they fit our plans better, that’s what we should do. That’s the technological view of reason that dominates serious mainstream political discussion today. It’s the reason Choice and Change, which tell us that the point of politics is remaking the world in accordance with human decision, have been so successful as slogans. The influential people who do the choosing are OK with choice and change as supreme principles, but the Church has problems with them. A government truly based on choice and change would be very different from the kind of government she has habitually supported. It would be a system of force in the service of willfulness, and thus a system of organized violence against man and nature. As such, it would be essentially bad, even though it might do some good things. In the last century Russia and Germany demonstrated how politics based on will can work out when the principle is taken with unmixed seriousness. Liberals are aware of the problem, but expect the principle of equal treatment to keep their system from becoming tyrannical. If everybody’s desires have to be treated equally, no one can tyrannize over anyone else, and the specter of totalitarianism is exorcised. Indeed, liberals believe their solution to oppression is the only one possible. A will’s a will, or so a liberal technocrat might say, so Catholics and others who deny the equal claim of all wills to satisfaction must be tyrants who want to impose their own will on everything. Even so, the liberal principle of equal willfulness can’t be relied on to avoid tyranny. People want different things, and it’s pointless to speak of paying equal regard to their inconsistent desires. If Bob wants an ecologically sensitive society and Bill wants SUVs for all, one of them has to lose, and liberal nonjudgmentalism means that there’s no good way to decide who it will be other than the needs of the system or the will of those in power. So it’s the position and will of the powerful that’s the standard after all. “Equal treatment” in the comprehensive sense liberalism seems to promise is simply a non-starter. In America it can seem that liberal technocracy—the triumph of choice and change—is a done deal. Constitutional law is the vehicle through which the principles our political elites view as basic become legally binding. The principles that have been made compulsory through constitutional interpretation include the right to abortion, the abolition of sexual distinctions, and an ever-broader principle of excluding religion from public life. In effect, our legal authorities have determined that public rejection of Catholicism and natural law is essential to the American public order, and contrary views have no place among us. The point, it seems, is that the essence of America is radical self-determination. So what do we do under such circumstances? It can be hard to say. Apart from terroristic extremes that are usually short lived, actual governments rarely follow unnatural principles with any consistency. Naturam expellas furca, tamen usque recurret: you may drive nature out with a fork, but she’ll keep coming back. Life continues to fall short of the liberal technocratic ideal, and even judges who generally accept the liberal conception of human rights often hang on to older ways of thinking. 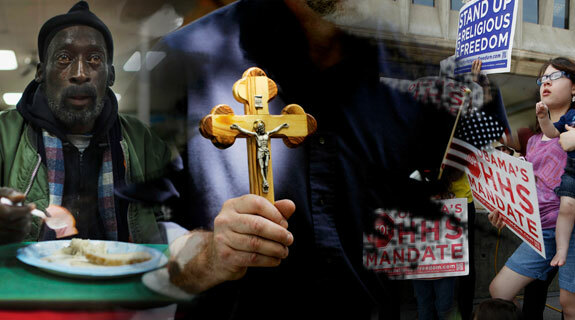 The Supreme Court has told the Obama administration that churches can choose their ministers in their own way, without regard to anti-discrimination laws, and the European Court of Human Rights recently determined that Italy can keep putting crucifixes in classrooms. So we’re hardly in the position of Christians under hard totalitarianism. Nonetheless, we need to recognize that we are in the midst of a struggle for the soul of our country. The optimistic post-war view that modern secular liberal society is neutral and even favorable to the Christian message hasn’t panned out. In America and throughout the West the dominant political theories and tendencies favor a comprehensive man-made scheme of life with no room for Christianity or natural law. The supporters of those tendencies aren’t as violent as the hard totalitarians of the last century, but they’re numerous, well-placed, well-organized, in control, and thoroughly convinced of the correctness of their position. That situation has to affect the attitude of the Church toward politics and government. In particular, it should affect her attitude toward social programs and the welfare state. Popes have criticized the social assistance state and called for something less centralized, but in practice many Catholics, including Church officials and Catholics involved in social services, are more interested in substantive results than how they are attained. Government seems a way to make sure important things happen, so those Catholics support initiatives like Obamacare. That’s a problem, because such initiatives are much more comprehensive in their intent and operation, and much less consistent with Catholicism, than traditional charitable enterprises like free clinics for the treatment of disease. Today’s social services are integrated with a guiding understanding of life. Rational thought and action require an ordered world, so if man won’t recognize divine order he’ll try to impose a this-worldly order of his own invention. That effort dominates present-day politics, and it means that liberal social programs are part of an essentially religious effort to establish a comprehensive system of ultimate reason and justice. The goal seems admirable, but religious efforts based on fundamental error can have catastrophic results. Liberalism is a purely this-worldly religious understanding, so it takes the view that ultimate justice can be organized and delivered through this-worldly means. To believe otherwise would be to accept the ultimate triumph of injustice and so deny the liberal faith. It follows that whatever government can’t deliver can’t be ultimate, and has to give way to what it can. The smooth and efficient operation of the liberal system, and the realization of specifically liberal goals, therefore become the ultimate standards for politics and morality, and everything has to give way to them. If a liberal project like education for tolerance were found to be at odds with the beatific vision, then the beatific vision would have to give way as a selfish private indulgence. It follows that the HHS mandate, which requires Catholic institutions to provide free contraceptive and abortifacient coverage, is not a happenstance add-on to Obamacare. For liberals, it is an aspect of the equal sexual freedom of women, which is a matter of fundamental justice that must be respected and promoted by any just society and any just system of medical care. Obamacare stands for the principle that the comprehensive definition and delivery of human physical and emotional well-being is a responsibility of the liberal secular state. As such, it is part of an attempt at an ordering of human life on hedonistic and technological lines. Whatever its appeal on immediate humanitarian grounds, it was a surprising mistake, given the prominence of issues relating to life and sexuality, to believe it could be patched in a way that would make it consistent with Catholic principles. The collapse of Christianity in Western Europe since the Second World War, and its current rapid decline among liberal Democrats, is no accident. The contemporary welfare state is founded on a comprehensive vision of human life that is totally inconsistent with Catholicism. To the extent that is so, how can we support it?